Confined to a wheelchair for the last three years, Brooklyn teen Julia Bruzzese is enjoying some newfound independence this summer – all because of a wheelchair lift outside her home. It took two years and some help from state Senator Martin Golden for the lift to finally be installed outside Julia’s Bath Beach home in early July. And it has been life changing for her family as well. “Whenever Julia needed to go somewhere … we had to carry her on our shoulders out of the house,” explained her father, Enrico. Several times a day, if Julia needed or wanted to leave the house, Enrico would carry her down 10 steps and then 40 feet to the family car, and back again, with help from Julia’s siblings. Now, the lift takes Julia and her wheelchair from door to door, and anywhere else she wants to go. “One of the first things she did was scout out local art schools and apply for volunteer opportunities to teach kids how to paint. So she’s really excited about it and we’re really excited for her … and also relieved,” Enrico said. Julia was a healthy, active girl up until about five years ago. She started developing high fevers, body aches, vision difficulties and fatigue. She was losing her long brown hair and suffering sensory disturbances. And then she lost the ability to walk. Her condition went misdiagnosed for months while her father continued to research Julia’s wide-ranging symptoms, which eventually pointed to Lyme disease, an illness transmitted through the bite of an infected tick. Beyond the symptoms, she had the exposure and risk factors. 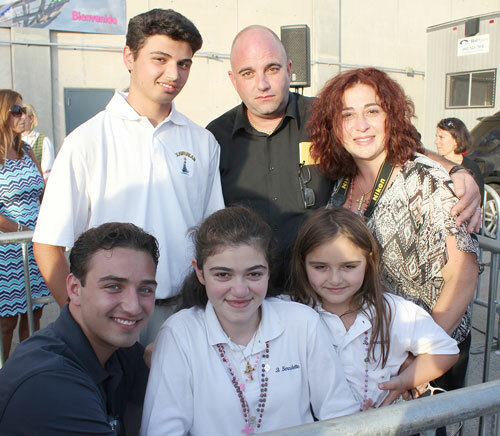 Light began breaking with a phone call from Julia’s then-principal, Sister Joan DiRienzo, M.P.F., at St. Bernadette School, Dyker Heights, who arranged for Julia and her family to see Pope Francis at John F. Kennedy Airport when he arrived in New York in September, 2015. Moments later, her prayer was answered when Pope Francis walked over to greet her personally. “He put his hand on my head, and then on my face. At that moment that he touched me, and blessed me, I felt like I was going to be okay,” Julia said. Suddenly, the pieces started to come together. After Pope Francis blessed Julia, markers for Lyme disease were detected for the first time in Julia’s blood. And the Bruzzese family doesn’t feel scared or alone anymore. “We have had an outpouring of love and support from all over the world, not just the community,” Enrico added. Funds were raised for Julia to see specialists and receive treatment, which includes a daily regimen of prescription medicines and supplements along with intravenous antibiotics and hydration. “On the first three days of treatment, Julia regained her upper body strength, her mental status; she started feeling her toes. We saw a tremendous improvement,” Enrico said. Julia’s health has continued to progress over the last three years – slowly, but steadily. She does her best everyday, drawing strength from her family and her faith. “After meeting the pope, I realized it [Lyme disease] happened for a reason and I started to trust that God had a plan … either to give me a different perspective in life and make me appreciate things more, or to help others and make sure they didn’t suffer the way I did,” Julia said. Now this rising sophomore at Xaverian H.S., Bay Ridge, hopes to use her experiences to start a foundation to help others who may have Lyme disease with early detection, finding the right doctors and receiving proper treatment. “I want to make sure people know and are aware of this disease because there are so many misconceptions. My goal is to make people aware and informed,” she said.